(SKNIS): St. Kitts and Nevis will be one of seven countries that will be participating in the Climate Change Adaptation in the Eastern Caribbean Fisheries (CC4FISH) project. A workshop held on May 30, 2017, jump started the discussion on the effects of climate change on the federation’s marine life. The Hon. Eugene Hamilton, Minister of Human Settlement, Agriculture et tal, expressed the importance of this project to the country. “In light of the issues threatening our environment, climate, change has become a very important issue that requires our utmost attention” said Minister Hamilton, while stating that the fishing industry plays a critical role in the sustainability of the country and these improvements are necessary and will remain a top priority for the government. 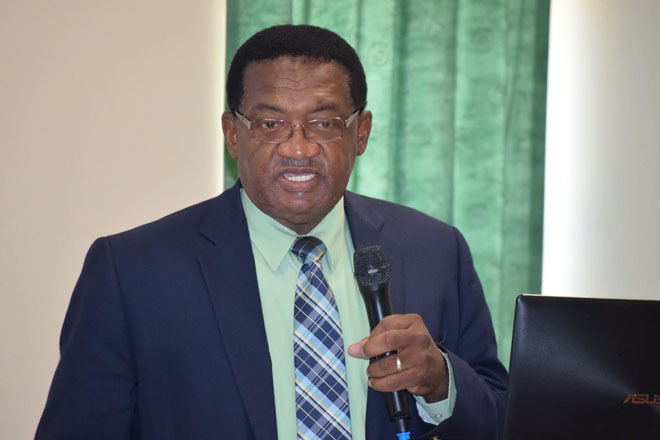 “This workshop symbolizes that the threat of climate change is serious” said Minister Hamilton as he emphasized that the fisheries sector is especially vulnerable to climate change. He further reiterated the importance of adopting best practices to safeguard marine life from the effects of climate change. He added that the Ministry has already adopted some safeguards such as the Department of Marine Resources’ introduction of the Ecosystem Approach to Fishing in 2011, and the strengthening of legislation surrounding the management of the fisheries sector in 2016. “Climate change is a crucial issue that no nation can deal with on its own,” said Minister Hamilton as he announced the collaboration with the Food and Agriculture Organization (FAO) and the Department of Marine Resources. He voiced that this partnership is important to increase resilience and decrease vulnerability to the effects of climate change. Minister Hamilton thanked those in attendance and commended the FAO for its relationship with the Ministry. “We have a long standing relationship with the FAO and we are thankful for the support of the FAO who has employed measures to sustain our local fisheries,” said Minister Hamilton. The project will facilitate regional collaboration by seeking institutional, technical and developmental solutions that are appropriate at the local level and which will contribute at the same time to the creation of Adaptation Benefits in the region. There are seven participating islands in the region which are St. Kitts and Nevis, Saint Lucia, St. Vincent and the Grenadines, Trinidad and Tobago, Antigua and Barbuda, Grenada and Dominica.